It was a little chilly in the pre-dawn light at the start in Milford, but as the sun came up, melting the frost, it became a very nice day. There was some wind to contend with after we turned back from Stillwater, but these gusts died off to near calm later in the afternoon. Pavement is in good condition most everywhere. There was active paving work underway in a few spots, leading us to conjecture that pavement would be even smoother next week. The one exception to generally smooth roads is the Old Cemetary Rd climb immediately after the penultimate controle. Old Cemetary is a narrow, broken, moderately steep grade that occasionally has auto traffic blocking the way. If you have any doubt about your mountain biking skills on skinny tires, I'd recommend dismounting to climb this short segment. Deer were visible thoughout the course. Please be alert. The cue sheet is mostly accurate, but we did notice a few minor discrepancies. -- At mile 41.2 the left onto Rt 658 / Vail Rd is actually the third left (current cue sheet says 2nd), although given the clear markings and correctly cued distance it's hard to miss this turn. The cue sheet could be revised to simply say "L". -- At mile 79.8 the right onto Creek Rd is currently unmarked. It occurs along a large, flat, open section of cornfield. It's immediately across from the access road to Good Shepherd cemetary. If you keep your eyes on the mileage you won't miss this right since there's no other turn nearby. On the other hand, if you daydreaming on the flat, pleasant road, you might accidentally pass the turn. -- At mile 85.3 the right onto Shades of Death Rd is unmarked. You can see the empty bracket atop the signpost from which the marker was stolen evidently. Swiping the road name markers on "Shades" seems to be a popular prank, especially around Halloween. But don't be frightened. This turn is well marked by the grassy area cleaving the T intersection. I'd cue it: "go right at devil's triangle". -- At mile 116.7 turn off auto-pilot after summiting Tunnel Rd. The return to Milford does not use Sweet Hollow, but rather stays on 579 till the right turn onto 614 at the stop sign. These two roads have straight, smooth, _screaming_ descents that many riders will zoom down at around dusk. Be sure you have your reflective gear on, be alert for deer, and don't descend faster than your guardian angel. The 200k cue sheet has been updated to reflect this information. Be sure to refresh your browser and download Draft 11, updated 10/30/2016. The November R12 Series event again features the perennial favorite Stillwater 200k route (run in the reverse direction) AND the Milford 100k for randonneurs interested in pursuing the RUSA P12 Award. Event details and cue sheets have been posted on the PA Randonneurs website. Registration is open until the Thursday before the event. Sign up now. PA SR Recipients Bill O, Gil L, Bob T, & Michael G. along with former RBA Tom R.
Just when everyone thought summer weather might carry through the entire month, autumn arrived just in time for the Fall Classic. Instead of temperatures of 60 to 80 and sunny skies we had seen all week, riders were greeted with starting temperatures in the mid-40s, persistent drizzle, and a strong northwesterly wind. A few registrants looked at the forecast and reconsidered. Of the 32 riders originally registered for both events, only 19 riders rolled out on Saturday and slowly made their way upwind and into the cold dampness. Riders Taylor Brown, Jon Fox, Ryan Stanis, and Aleksey Vishnyakov all persevered in tough conditions on one of the most challenging 200k routes in the PA Randonneurs catalog to join the ranks of randonneurs. Congratulations! Grace Pineda and Eoghan Barry claimed first finisher distinctions in the 150k and 200k, respectively. The rest of the field trickled in throughout the evening. The Fall Classic event, now in its eleventh running, was started during the very first year of PA Randonneurs. It has been held every year since and continues to attract many new randonneurs to the sport. While it may have originally signaled the end of the season prior to the R12 Series, it continues to provide a late-season fun event and provides a chance to distribute the coveted PA SR awards. 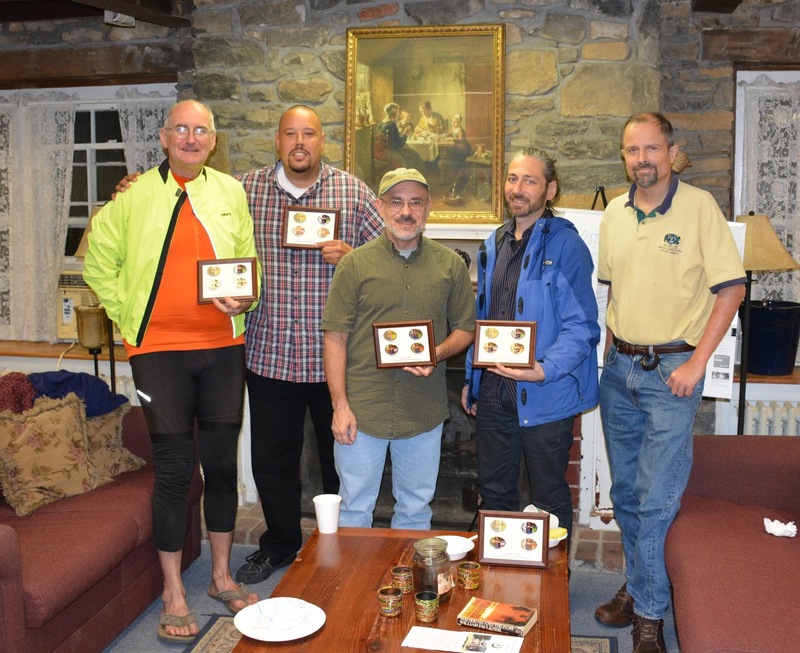 Six hardy PA Randonneurs earned the honor this year. Two of them even finished the 200k before collecting their hardware. Congratulations to Michael Gorman, James Haddad, Greg Keenan, Gil Lebron, Bill Olsen, and Bob Torres for their accomplishment this season. 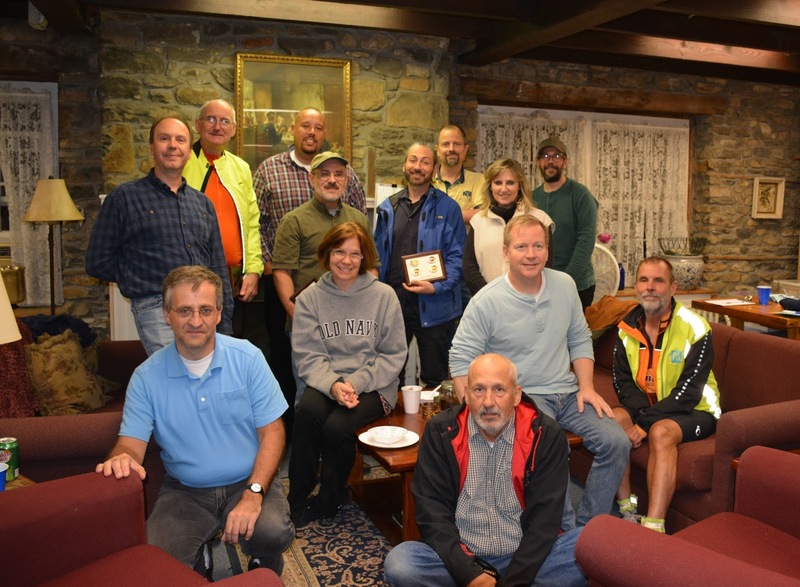 This year we also honored PA Randonneurs founding RBA Tom Rosenbauer as he steps down from the role. 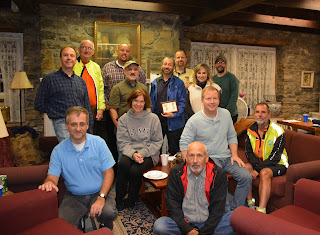 Tom's vision, dedication, and high standards in brevet organization have made PA Randonneurs one of the top regions in RUSA and introduced many individuals to the sport. Riders and quite a few non-riding guests stopped by throughout the afternoon and evening to offer congratulations and thanks, share stories, and welcome returning riders. If you did not get a chance to stop by, just post a comment below or drop Tom an email. Tom, it was great to see you today. I've a feeling you will be joining us again, maybe for a ride or perhaps simply to share randonneuring stories. Either or both would be welcome. And if the ride is a short ride, count me in! Andrew, thanks for arranging everything. I was really reluctant to go out there given forecast for all-day rain and winds, but it was fine after all. It's a terrific route and a beautiful one regardless of the weather. See you in the spring, maybe sooner. I would like to thank volunteer Chris Nadovich for his tireless contributions to not only this event but for the entire season of events staged out of the Weisel Hostel. He rode the course checkout in the sweltering heat of early October, somehow managed to find time between important personal engagement to open the hostel Friday evening, prepare breakfast and send riders on their way Saturday morning, and retrieve a delayed rider late Saturday evening. Regular grill-master Bill Slabonik traveled down Saturday afternoon in what has become an annual volunteer event for him and offered up his truck to retrieve the delayed rider. The weekend would have been impossible without their help. Next up is the Le Retour de Stillwater 200k and the Milford 100k on November 5. Event details have been posted on the website and registration is open through November 3. The registration deadline for this brevet is Thursday, October 20. The event page previously indicated registration closure on the 15th which was last year's registration deadline. If you're planning to clip in, please register by 5pm on Thursday so I have time to get all that brevet cards prepared. "This classic course is in good shape and there should be no significant cue-sheet changes needed. Many of the roads have new or near-new pavement making for very enjoyable riding, especially on those rare stretches of relatively flat country road. A notable exception to the smooth riding is the final descent down to the closed bridge on Headquarters Rd (mi 111). This section of road is poorly maintained. The many hazardous bumps, cracks, potholes, and downed tree branches will be hard to see in the dusk. When you are cruising pleasantly along on the smooth, early part of Headquarters Rd, enjoying the lack of traffic because of the closed bridge, let those "Road Closed Ahead" signs remind you that the last quarter mile downhill is in bad repair. There is some road construction at a bridge near the base of the Fox Gap climb on Rt 191 at mi 53, but don't get your hopes up. It doesn't seem likely that they will close the road. You'll still have to climb Fox Gap, which seems to be taller than I remember -- maybe the construction has raised the mountain a few hundred feet." With only about 10.5 hours of daylight available, 200k riders will need lights and reflective gear, unless you have previously finished the course in less than 9.5 hours. All riders are encouraged to get into the winter habit of riding with lights and reflective gear. You never know when your ride will be delayed and you'll find yourself returning in the dark. Outgoing RBA Tom Rosenbauer will be on hand at the hostel in the afternoon for those wanting to thank him in person for all that he's done in creating the Easter PA Randonneurs. So even if you can't ride, plan to stop by and wish Tom well.